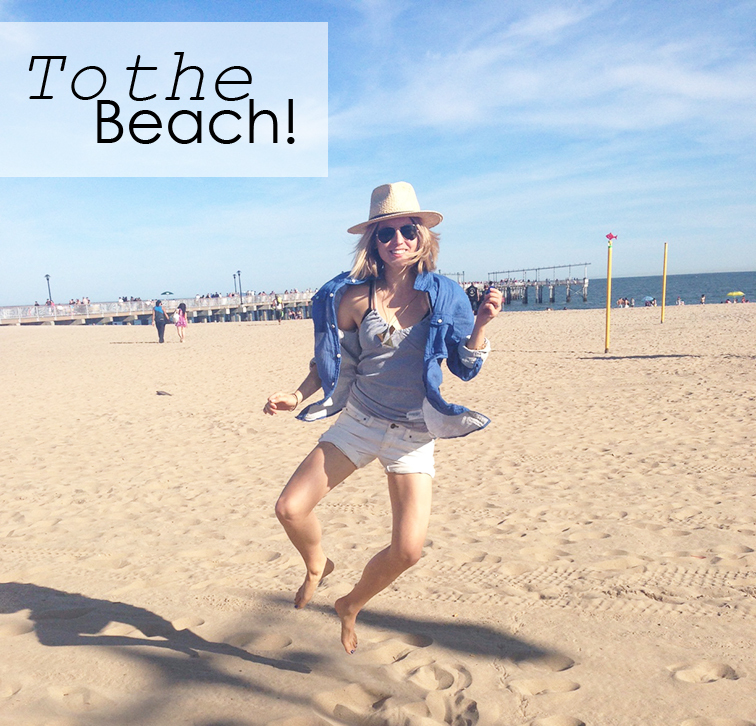 Fashion Over Reason: To the Beach! Some folks grow up with the beach in their backyard. Instead of building snowmen and learning how to skate on ice, they became pros at applying sunscreen and their spare time is taken up by wave-catching. I belong to the former group (as if you didn't know). The beach, what a foreign concept. When your closest mass water source is a large over-poluted river that barely reaches 65 degrees during its summer peak, you're hard-pressed to equate the shore with regular pastimes. The only moments spent on a real ocean's beach, complete with the finest white sand the earth can provide, and water so crystal clear that you could well be in a pool, is when you take flight on a giant iron bird knows as an airplane. When you never see the ocean, when the only nature smells you recognize are "fall" and "spring" and when you just don't find it necessary to invest in a fun collection of bikinis, anything that relates to being at the sea is magical. It's magic because when you come from where I do, the beach is synonymous with vacation; it's an event and nothing less. It happens in the summertime when you're on break and can drive up to one of the nearest coast towns, say in Maine or the Jersey Shore; or in the winter when you fly anywhere closer to the Equator. It's magic because of its divine, unmistakable salt water smell that makes you weak in the knees. It's magic because all of the above are constant reminders that you are indeed in a place where the only thing better to do than nothing is more nothing. That sandy pathway across the tall grass leading from the road to the sand is a sight that always gives me butterflies. It lets you know that you've arrived. It's your welcome committee. That rare sight demands to be taken in every time I encounter it, as it's the passage from the regular world into one where waiting for the tide to rise is the only thing that matters. That sandy lane is there to steer you into a zone where the only thing to think about is how far the horizon goes and how dark your tan is. Oh, and that heavenly ocean aroma. On a sublime weekend a few weeks ago, we decided to grab our bikes and ride down from North Brooklyn all the way to Coney Island -- 12 miles to be precise. It was exciting because it was going to be my first time on the legendary boardwalk. There was no sandy pathway between the tall grass, nor were there beach homes overlooking the water, but there was the distinctive salt water smell, a lovely boardwalk to strut on and Luna Park's legendary Wonder Wheel. The day would not have been complete without hot dogs and brewskis from the iconic Nathan's. But above all, my toes got the feel the sand without having spent one single air mile point. Great summer and beach outfit! You look amazing and I especially love the hat! Love your necklace and love boardwalks!! they make the beach so much more fun! Perfect look for the beach! I really like it :) I really loved the pictures! Hello doll, I live far from the seaside too, I can imagine your contentment! You look very pretty by the way! Lovely pictures, I want to go to the beach too. Great outfit. Hee hee love the first pix! Oh yes nothing says summer like the beach. When did you get there 6 in the am? There is no one there! Ha! Have you been to Fire Island yet? We should hit it up together, there is one part that is party party with the boys totally fun. One part that is more family orientated and one part that is more serene good for a shoot! You're a beach girl! Love that picture of you with the bike. That beach is lovely. This is what summer is all about! I love it! And it's never truly a beach day without Nathan's grub.